Corona Santiago owns the Big VIII League in girls soccer the way Corona Centennial owns it in football – with zero competitive empathy. And why would things change this season? It’s not like Mike Fleming or the pipeline of players have gone anywhere. Fleming has lost only a handful of league games and owns four consecutive unbeaten Big VIII titles. And it’s not like the competition has improved. Riverside King was really good late in the season with an all-senior team but graduated everybody. Norco, which skillfully kept a mess under wraps, will probably tread lightly. Eastvale Roosevelt has some attacking talent but is not on the same level, and both Centennial and Corona are sad step-sisters to the Sharks. CORONA SANTIAGO (16-6-5 overall, 8-0-2 Big VIII) might not have had the playoff experience it was seeking to cap the ’15-’16 season, getting dumped on the road in the second round, but the Sharks continue to set astonishing marks at an astounding rate. The team is 33-0-7 vs. Big VIII opponents over the last four seasons, finishing the season ranked inside the Top-100 nationally each time. 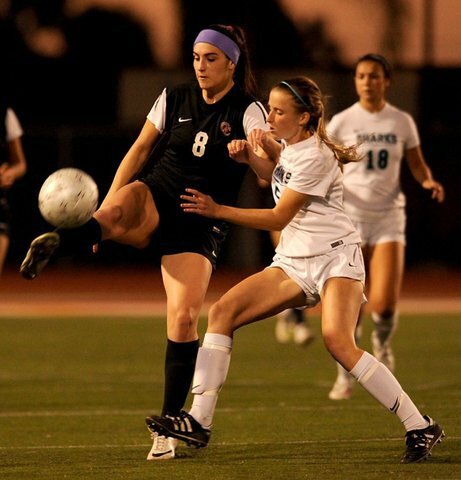 Senior Emily Gehlbach, who played a key role in the CIF-Southern Section and SoCal Regional title team in ’14-’15, returns to lead the team in her senior year. NORCO (16-9-2, 8-2-1) was thrown into turmoil midway through its campaign when then-coach Clint McDaniel resigned following allegations of fostering ineligible student-athletes. The Cougars lost their final three games, and their best players, Chandler McDaniel and Zoe Isibor, graduated. This season, senior Taylor Windham and junior Brianna Pearson should keep the team in the playoff hunt. RIVERSIDE KING (24-7-1, 5-4-1) just kept winning when it came time for the playoffs, refusing to run out of steam until the CIF-SS Division 2 semifinals. The Wolves earned a SoCal Regional playoff berth, and a trip to San Diego to cap the program’s best-ever campaign. Now the question is how the team responds to the graduation of 17 seniors. EASTVALE ROOSEVELT (10-9-4, 4-4-2) secured a point vs. both Riverside King and Corona Santiago on the final week of the regular season before going on the road in the first round of the playoffs and pummeling Redlands East Valley, 4-2, with two goals from senior Darrian Reed. CORONA CENTENNIAL (7-12-2, 2-8-0) endured six consecutive shutout losses to finish the with back-to-back shutout victories, but struggled to score goals overall (19 in 21 games) and were 0-10-1 when held scoreless. CORONA (7-18-1, 1-9-0) scored just 16 goals — three vs. league opponents — in 26 games last season. Dec. 8 – Grand Terrace at Santiago, 5 p.m.
Dec. 14 – Chaparral at Riverside King, 5 p.m.
Dec. 20 – REV at Riverside King, 5 p.m.
Jan. 3 – Chino Hills at Santiago, 6 p.m.
Jan. 10 – Riverside King at Santiago, 6:15 p.m.